If you’re looking for a Hawaiian oasis, you’ll find it on Kauai. 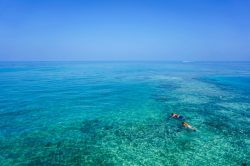 This tropical paradise is the ideal destination for fun and relaxation with the family or your special someone. You’ll get to experience the magic of the mountains, valleys, and, of course, beaches! 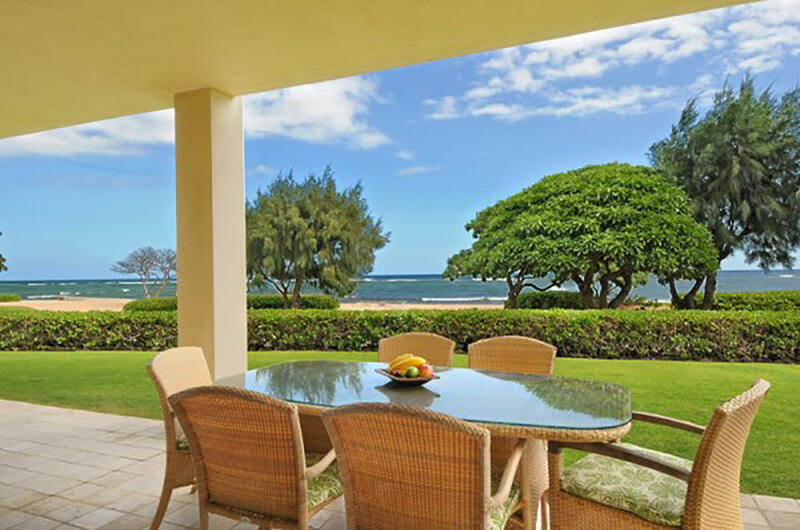 We are proud to offer several beachfront condo rentals on Kauai that will give you a magnificent view at any time of the day. Each of these rentals suits 6 people between 2 bedrooms and 3 bathrooms, providing ample space for everyone in your group. You’ll be in the lap of luxury thanks to amenities like wall-mounted TVs, an elevator in the home, a sub-zero refrigerator, and stunning cabinets and countertops. 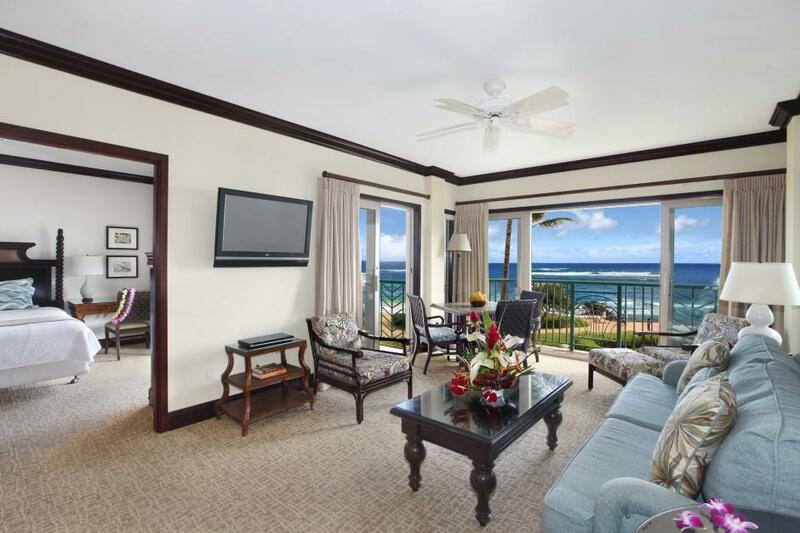 You’re also within walking distance of the beach, shops, spa, and more. Click to see more. Your party will love this incredible rental. 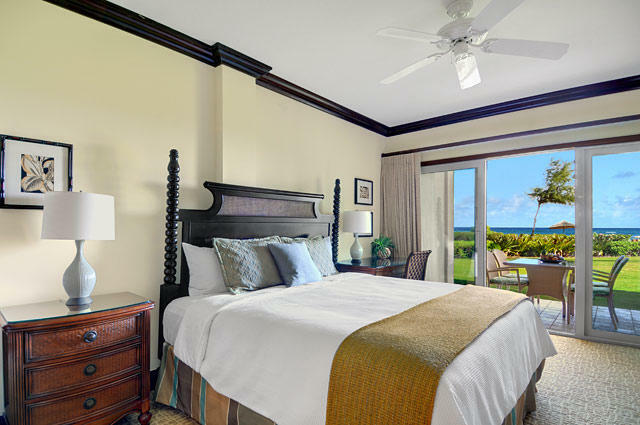 Central AC and a washer/dryer set keep you comfortable, while the custom tropical furnishings add a unique touch. It’s easy to reach the pool, shops, and anything else in the area. Click to tour rental. The prime location of this home keeps you away from the world while giving you a fantastic view of the waters. 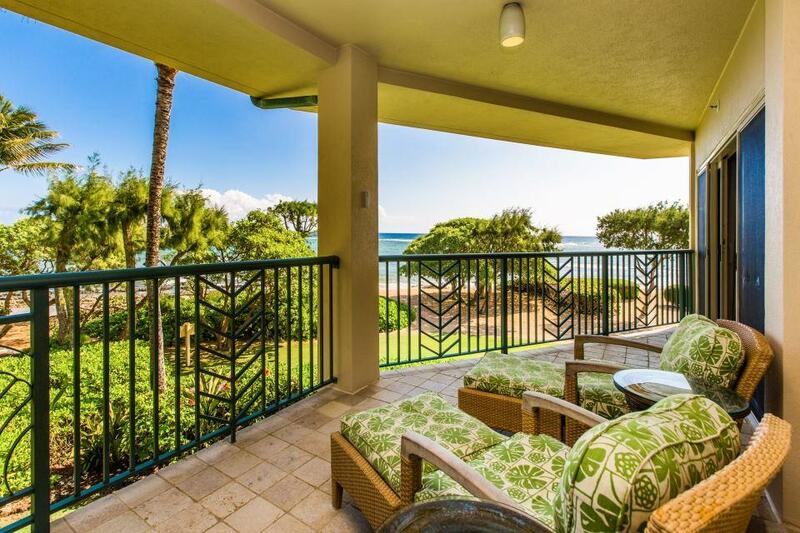 Step out onto your lanai to catch the breeze, or walk downstairs to the BBQ area and pool. 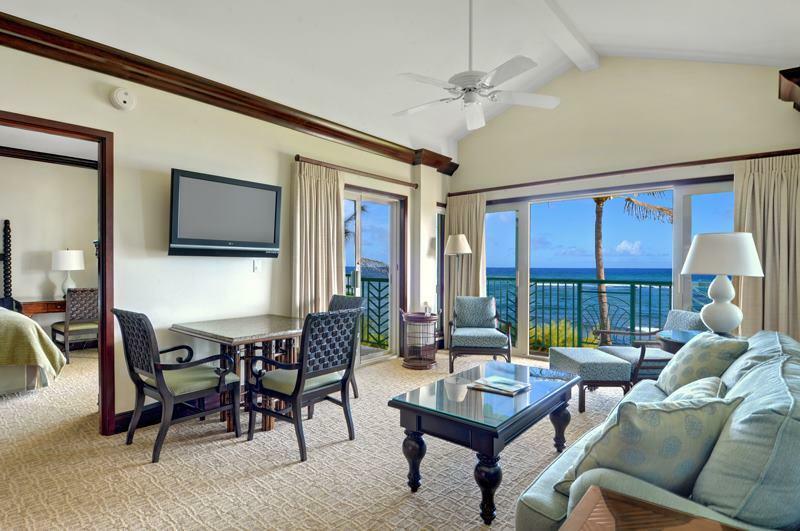 Inside the home, the finest appliances and furnishings will make you feel like you’re in paradise! Choose this rental! Bring your party to this “Royal Oceanfront Jewel!” The home is complete with cathedral ceilings, a state-of-the-art kitchen, multiple tubs and sinks, and so much more. 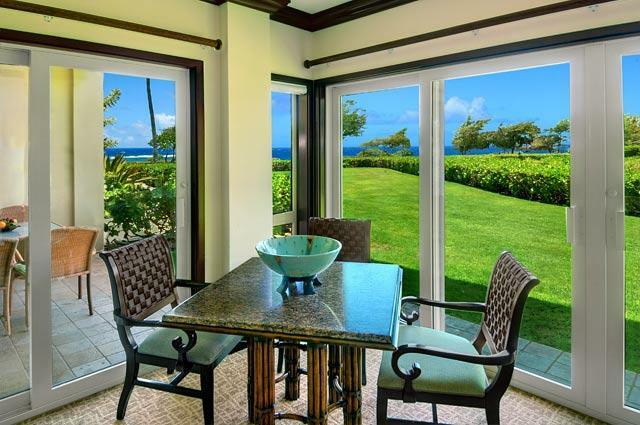 Even more stunning than the home itself is the breathtaking view of the ocean. Click to see more. 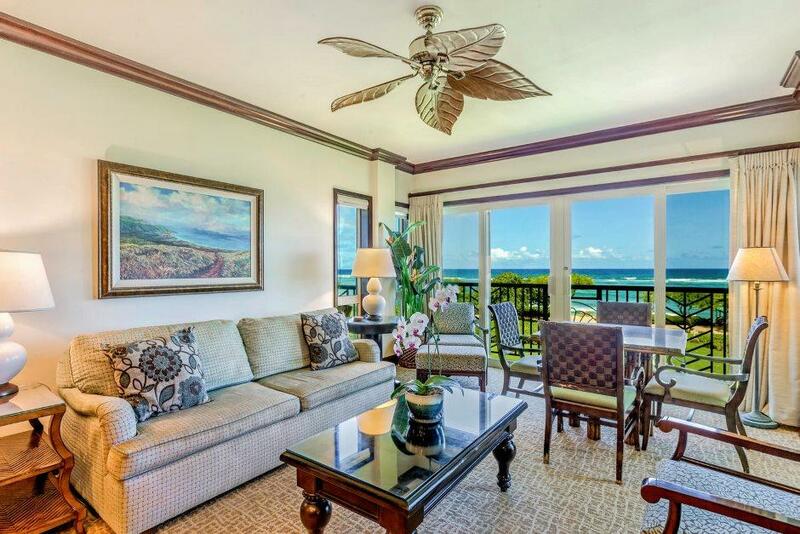 This ground-level unit is the ideal spot for you to witness the spectacular views of the ocean. You’ll have access to unbelievable amenities like a sub-zero refrigerator, multiple flat-screen TVs, iPod docks, tinted windows, and much more. Click to tour rental. If you’re a movie lover, this is the spot for you! Robert Downey, Jr., stayed in this incredible penthouse villa while filming Tropic Thunder, and now you can experience the same level of luxury. You’ll have granite countertops, custom cabinetry, multiple jacuzzi tubs, and an incredibly furnished kitchen. Choose this rental for your vacation. 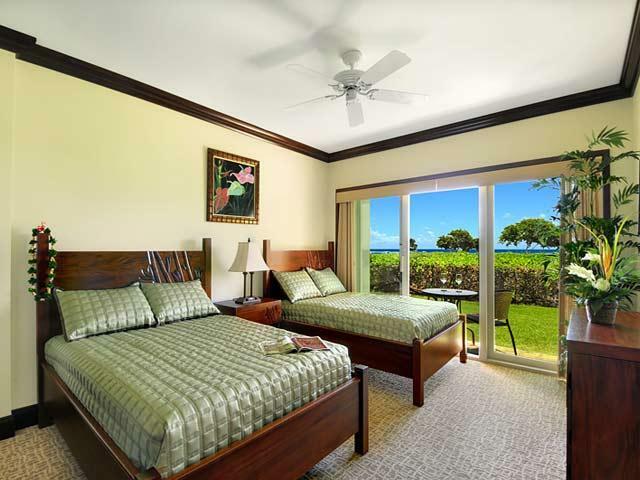 This beachfront ground floor unit is one of our most conveniently located Kauai beachfront rentals, as the building is just steps from the sand! Your luxurious furnishings and amenities can’t be beat, and our resort boasts some unbelievable features like a lazy river, waterfalls, children’s pool, and more. Learn more about this rental. This rental is perfect if you’re looking to spend lots of time outside. 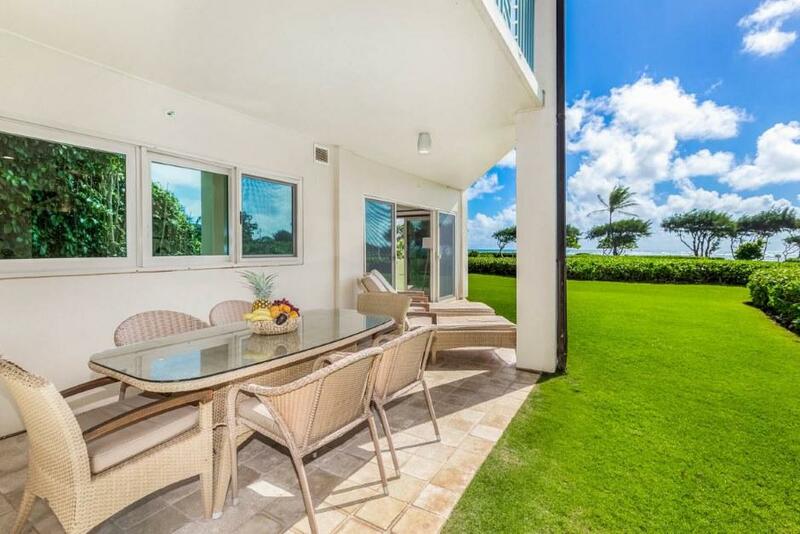 Lanais, dining tables, and ample yard space are ideal for your family, and you are just steps from the pool and BBQ area while still staying secluded. Inside, there are high-quality amenities like a Smart TV, gorgeous flooring and cabinetry, and gourmet kitchen appliances. Click to tour this rental. Your whole family will love this rental in our highly desired “A” building, just steps from the beach! Look out from any room to experience magnificent views of the water and, maybe, spot a whale! 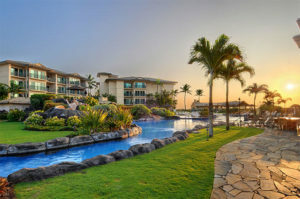 You’ll have access to awesome resort features like tropical landscaping, children’s pool, lazy river, and more. Learn more about this rental. Relax and forget the world in this beautiful unit, just moments from the ocean and a short walk to the shops, spa, and more. Both bedrooms boast Heavenly Beds to ensure you a great night’s rest, and other high-quality furnishings were designed by some top international interior designers! See more about this rental. 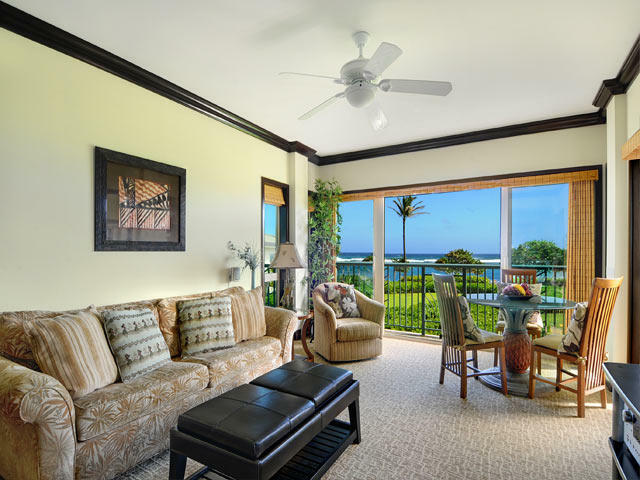 Book Your Kauai Condo Rentals Today! 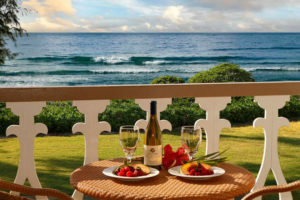 The gorgeous island of Kauai is calling your name! 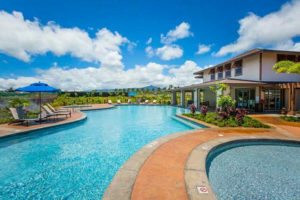 Experience all the fun and sun at Waipouli Beach Resort. Browse our website to view all of our rental options, or contact us today for more information about our properties and our incredible location.